Who Else Wants to Experience a Unique, One-Of-A-Kind Immersion-Style Health Retreat for Purification & Relaxation in an Astonishing Tropical Setting while Learning to Balance Your Body and Your Mind...? A) We begin your journey into vibrant health, crystal-clear mind and bright spirits in sunny Miami Beach, Florida at the infamous Russian & Turkish Baths; founded in New York in 1892, Russian & Turkish Baths is a labyrinth of exotic saunas, therapeutic steam rooms, and sumptuous massages where you can escape everyday stresses to relax, transform, recuperate, rejuvenate, and wash away all the tensions of everyday life. 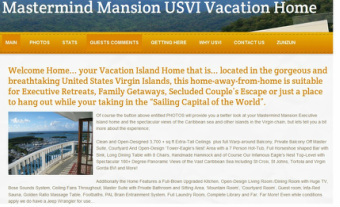 B) Then you’re transported 1,100 miles southeast for one full week on “The Jewels of the Caribbean”; St Thomas & St John, United States Virgin Islands. Surrounded by the clear blue waters of the Caribbean, St Thomas boasts one of the most beautiful harbors in the world and is full of energy as the most visited port in the Caribbean, offering elegant dining, A-rated beaches and possesses numerous sublime natural splendors, such as stunning views of the Caribbean from 1,500 feet above sea level. St. John Island, predominantly a national park is a nature lover's favorite with a comfortable pace, is perfect for enjoying the island's world-renowned beaches offers hiking, camping and breathtaking views. 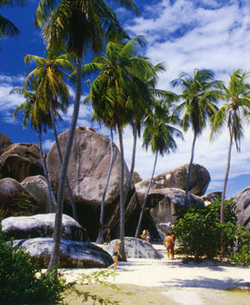 C) We conclude your amazing transformational experience with a Yacht excursion to spend the closing day at the world-famous “Baths” on Virgin Gorda, British Virgin Islands; a stellar natural attraction with exotic, refreshing pools and grottos formed by giant boulders strewn across peaceful sandy beaches. There’s never been any event like this and it’s sure to transform lives… from the inside out! YOU’LL KICK YOURSELF IF YOU MISS THIS ONE!!! Along the way you’ll learn how to eliminate all ailments within, strengthen your immune system, and make a healthy change that will last a lifetime!! You’ll even learn how to help and assist your friends and family members with their health situations. You’ll kick yourself if you miss this once in a lifetime experience! 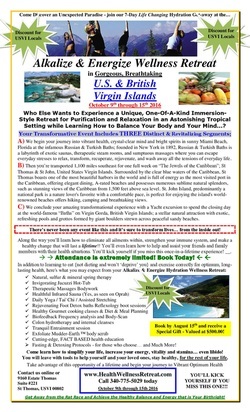 Invite Friends and Family to Join You at This Remarkable Immersion Wellness Retreat.